Lucasfilm dropped a Millennium Falcon-sized bombshell on Monday when it announced that Billy Dee Williams is set to reprise his role as the cape-rocking, smooth-talking, gonna-risk-it-all gambler Lando Calrissian in Star Wars: Episode IX. The Hollywood Reporter confirmed the news, noting that speculation about the actor potentially joining the newest Skywalker saga installment heated to a rapid boil after Williams backed out of a forthcoming pop culture convention and cited "a conflict with a movie schedule" as the reason why he could no longer attend. Of course, chatter about Williams' ties to Episode IX had been buzzing about the galaxy far, far away for quite some time before the actor ever retracted responsibilities at an event. In June of 2018, fan site Fantha Tracks reported that Williams was on board Episode IX, and that an official confirmation of his casting was expected "very soon," likely around the time director J.J. Abrams began filming in July. That info followed shortly after Williams mentioned during an appearance at Orlando's MegaCon that he was working with a personal trainer and had started a "whole new diet" — which many took as proof that he was getting in peak physical form for Episode IX. How exactly Lando will fit into Episode IX remains fuzzy for now, but it's safe to assume that he will, at least in part, be ushered into the storyline through Leia (the late Carrie Fisher) and her need to reignite the Resistance after the events of The Last Jedi. He very well could be hanging out in the Outer Rim and may be pulled in to serve as one of those Resistance allies referenced in The Last Jedi. Or maybe, while he's living his best life by pilfering space coins and playing the ponies in a casino city not unlike Canto Bight, he'll get pulled back to fight the good fight. In all seriousness, regardless of how Williams' Lando ends up involved in the events of Episode IX, it'll be wonderful to see his face on the silver screen once more. 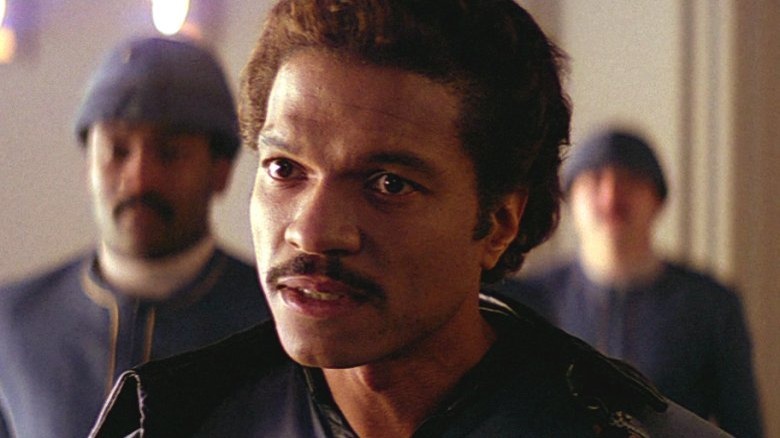 Episode IX marks the first physical appearance of Williams' Lando in film since 1983's Return of the Jedi, and only the third Star Wars movie in which the actor portrays the character he originated in The Empire Strikes Back. Triple-threat talent Donald Glover (a.k.a. Childish Gambino) recently played a younger version of Lando in director Ron Howard's Solo: A Star Wars Story. And while fans and critics alike applauded Glover's ability to step into the role with ease, going so far as to say the actor stole the show and most of the attention away from young Han Solo star Alden Ehrenreich, we're certain that longtime franchise fans will be pleased to hear that Williams, and not some other dude who happens to look a whole lot like him, will portray Lando in Episode IX. For Star Wars: Episode IX, Williams joins returning actors Daisy Ridley as Rey, John Boyega as Finn, Oscar Isaac as Poe Dameon, and Adam Driver as Kylo Ren, as well as franchise newcomer Keri Russell, who was recently cast in an undisclosed role. The film is slated for release on December 20, 2019.